Sun Cellular Postpaid Plans Affordable O+ USA and Alcatel Gadget Bundles, Starting at Php 350 per Month Only! Sun Cellular proves that you don't need to subscribe to an all too expensive postpaid plan just to be able to get a good bundled gadget. That said and in that sense, I guess we can really call Sun Cellular 'The Good Choice'. 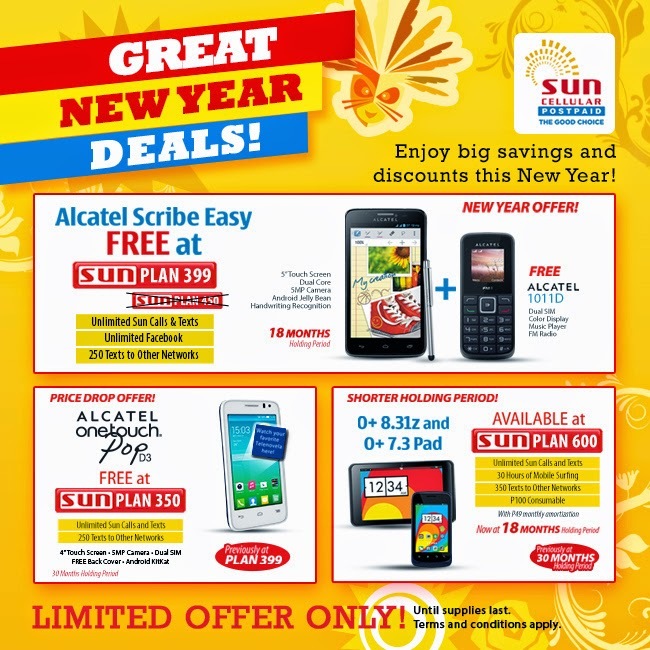 To jump-start the year, Sun Postpaid will be offer three amazing gadget bundles for a whole lot less! 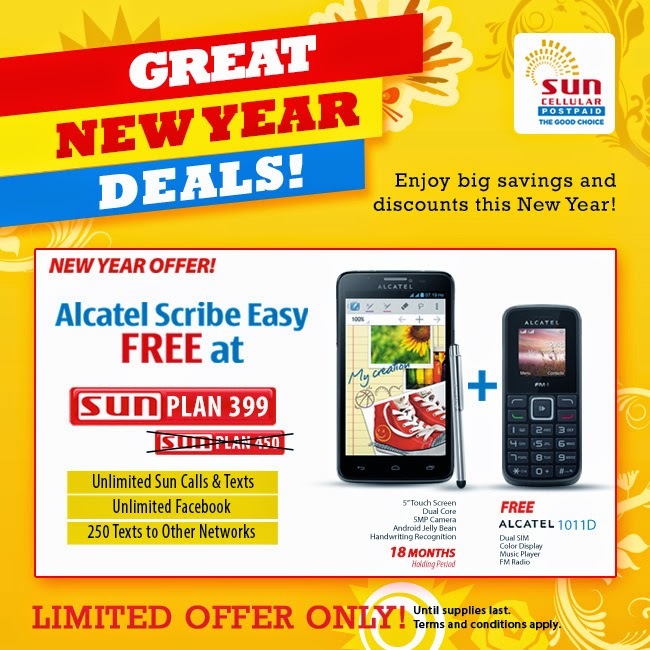 Alcatel One Scribe Easy (with rubber-tipped stylus), which used to come with Sun Plan 450 with 30 months holding period, is now available for free for 18-months with Sun Plan 399. And subscribers will even get a free alpha-numeric Dual SIM Dual Standby Alcatel 1011D phone to go with it. No incremental line subscription required. *Sun Plan 399 gives you unlimited Sun calls and texts, unlimited Facebook book, and 250 text messages to other networks per month. *Sun Plan 350 comes with unlimited calls and texts to other Sun numbers and 250 texts to other networks per month. And finally, O+ 8.31z plus O+ Pad 7.3 (smartphone + tablet O+ Sun Bundle), which was originally offered under a 30-month holding period, is now paired with Sun Plan 600 + Php 49 amortization under an 18-month Holding Period. *Sun Plan 600 gives you unlimited calls and texts to other Sun numbers, 30 hours of mobile internet surfing, 350 texts to other networks, and Php 100 consumable amount per month. This offer will only be good for a limited period or until supplies last so, if you're interested, avail of your desired gadget bundle as soon as you can via the freshly opened Sun Online Store. You can learn more about this generous via Sun Cellular's Official Website or by visiting a Sun Cellular Store or Business Center near you.